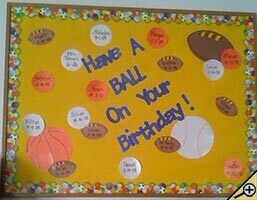 The Birthday Bulletin Board Ideas page will provide you with great resources for a number of birthday related topics. Our bulletin boards will help you integrate various activities into your daily curriculum. Ideas within the birthday bulletin board pages include resources for a number of birthday displays and celebrations. Help make your students feel special on their special day. Student names and birthdays printed on football, baseball and basketball cutouts. Make an apple tree out of green and brown construction paper. Make twelve red apples for each month of the year. Next, cut out enough green worms for each child in your classroom. Write the child's name and birthday on the worms. Finally, arrange your board so that the worms are eating their way through the apples. It is a really cute bulletin board. I made fish from clip art on the color printer. Then I used long green and brown butcher paper and twisted it to make "seaweed." On a blue background, I mounted the fish and the seaweed and used the title "A Sea of Birthdays." This stays up all year! I made a birthday train. It was a lot of fun. I decorated each train car with items that went along with each month. Then on the cars I placed the children's names. I also made a birthday bear that rides in an extra car at the very end of the train. He holds a large sign that says Happy Birthday __________ and you fill in the birthday childs name. It is sooo cute!!! I painted a "Birthday Chair" that I had bought at an antique store. The birthday chair is very colorful, using all the colors of the rainbow. This chair is very special to my students as they love sitting in it on their "special" day. First thing in the morning, the birthday boy/girl trades in his or her chair for the special chair for the day. During bell work, students write up the nicest thing about that student (which I make a book out of it) while we listen to a Birthday songs CD. I then have a board which honors the birthday student by displaying a digital photo of him or her sitting in the chair. It is a lot of fun celebrating our birthdays! I use 2 yards of colorful, bright fabric, a cake board circle painted as a clown face, white gloves, and a black party derby hat cut in half to make a three dimensional clown for my birthday board. Just gather the fabric using rubber bands at the arms, legs, and neck to shape his body. Add the gloves , cake board circle face, and hat with a large silly silk flower, to complete the clown. I also have him holding a bouquet of colorful balloons with curly ribbon strings. I use birthday gift shaped note paper on which I write each child's name and birthday and then arrange them by months on the board. This bulletin board is a great way to show the birthdays of all of the students. I make a sky background with clouds. Then I add a bear holding a bouquet of balloons. I use yarn as the balloon string and construction paper for the balloons. On each balloon I write the student's name and birthday. For a large class you can use the balloons for more than one child. As a heading for the bulletin board, I use cut out letters to spell "Happy Bearthday!" A teacher at my school does a Birthday Board. She gets the students to write their birthday down on the first day of school. Each month she puts all of the students names, whose birthday is in that month, on the board with a caption at the top of the board giving the month. She changes it on the first of every month. Have students cut squares out of a variety of pieces of wrapping paper. Then take the students pictures and type or have them write their birth date below their picture on a sentence strip. Laminate. Then have students make or place bows on the top like it is a birthday present. I use tootsie pop suckers! I create a sucker tree with tootsie pops. Under each sucker, I place the child's name and birthday on a decorated on a "paper" gift.The students get to enjoy their own tootsie pop on their birthday! Watching that sucker all year certainly teaches patience! For summer birthdays you can do 1/2 birthdays. 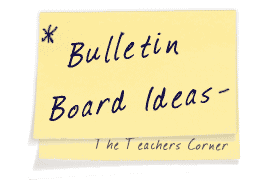 Do you have pictures of your completed bulletin boards? Send them to us using the link at the top of the page!